One of the prettiest walks in the Tulsa metro area is Redbud Valley, an oasis along Bird Creek northeast of Tulsa, just east across the Rogers county line. Its surroundings are much more functional than scenic: to the south is the Lafarge Cement Plant and an industrial area, to the east is Waste Management’s Quarry Landfill, to the north is the quarry for Greenhill Materials, and a few miles to the east is the Port of Catoosa. Redbud Valley is a legacy of Dr. Harriett Barclay, a botanist at the University of Tulsa who valued the many flora abounding on this plot of land with a travertine spring issuing from a high bluff of Oologah limestone. She spearheaded an effort, assisted by the Nature Conservancy, the now-defunct Tulsa Tribune, and University of Tulsa, to preserve this land, which is now part of the City of Tulsa’s Oxley Nature Center. The trails were built by Boy Scouts and students at the University of Tulsa. My friend Carrie Fleharty first showed them to me several years ago and I’ve been back a number of times, including some visits with photos in October 2009 and January 2011. Fellow science teacher Betty Henderson and I decided to walk the trails on a warm day in late May, celebrating the first week of our summer break and compensating for a float trip with friends which was cancelled by an uncertain forecast. We ascended the stone steps to the top and crossed the thin-soiled woodland to the prairie, which was alive with grasshoppers and butterflies. We then climbed down the ravine to the base of the long limestone bluff, where we found no water issuing from the travertine spring cavern, which was closed. 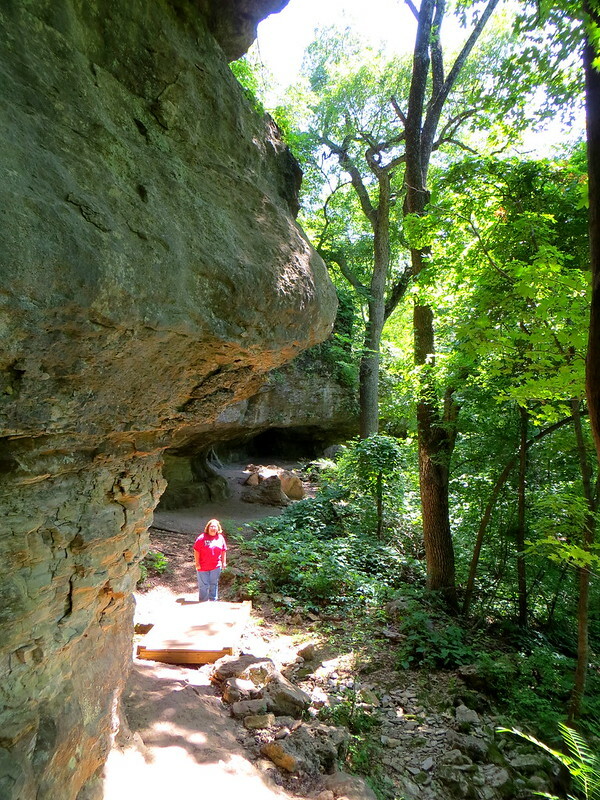 The trail led along the base of the high bluff, with overhanging rock making the trail fun and scenic. Betty provided some scale for a shot of the bluff and I ventured into a tiny cave opening which was not closed. When the trail split, with one part running along the base of the bluff and the other running down along the bottomland near Bird Creek, Betty and I split up, with me taking the bluff trail. I navigated between trees and under long overhangs created by the eroded bluff face. The greenery was abundant, with trees leaning out seeking sunlight. The trail led through large fissures in the bluff face and a huge cleaved rock, one of my favorite spots. The trail neared the end of the west face of the bluff, and then rounded the north end and descended to join the creek trail, with Betty soon appearing for the brief walk back to the parking lot. The only trail segment we did not cover between the two of us was the Woodland Fork, which is a shortcut bypassing the prairie. It is always a pleasure to visit this oasis nestled in the northeast corner of the metropolis Tulsey Town has become. Stone Stair picture was very nice. OUTSTANDING! 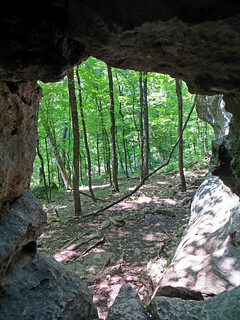 A bit like Devil’s Den…the girls and I have added this to our “to be hiked” list.